Winter in Delhi is the time for foodies to gorge on delicious street food. 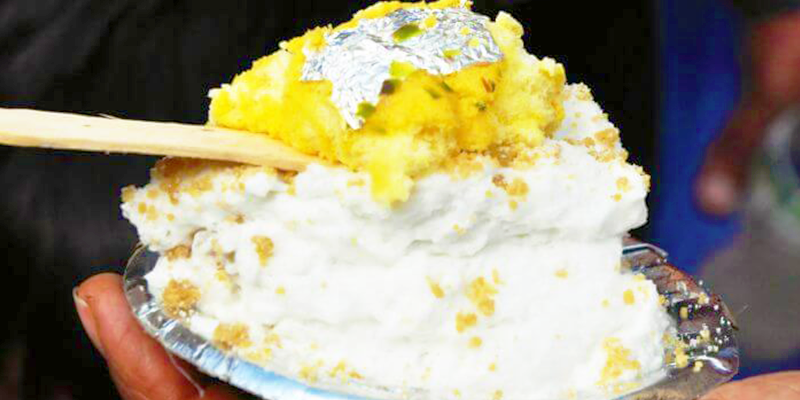 Just before winter makes an exit, visit Old Delhi and savor the delicious “Daulat ki Chaat”. It is perhaps Old Delhi’s most pleasantly surprising street food. Though the word “Chaat” would bring in expectations of tasting a tangy, spicy and hot item, but Daulat ki Chaat is just its opposite. So, how does this delicacy taste? Well, the taste of this heavenly dessert is truly delectable. Wait! Did I say “Dessert”? Indeed, it is a dessert and one that vanishes instantly. But, it leaves behind a trail of the rich taste of sweetness. You can feel the distinct flavors of cream, saffron, and nuts that go into its preparation. Preparing this milk-made delicacy is a skill in itself and it takes many hours to churn a day’s worth of “Daulat ki Chaat”. Firstly, milk is churned out for hours, when it is ready the foam settled on top is collected and allowed to set. In the next step, the wedges are finely cut. And finally, it is served after mixing with khoya, layered with saffron-flavoured foam and then garnished with powdered sugar and nuts. The final outcome of this extensive preparation method is not just delicious but beautiful to behold. A nice mix of white, creamy and lemon yellow delight. Makkhan Malai, Nimish or Malaiyo call it by any name the essence of this heavenly dessert remains the same. In Delhi, it is known as “Daulat ki Chaat” probably because of the rich ingredients like saffron, pistachios, and Khoya. Some also believe that it owes its name to its nature – one moment it is there, and the next it vanishes! Though the elaborate name “Daulat ki Chaat” gives a royal impression, it is not sold at any high-end shop. Rather this delicacy is readily available on streets of Chandni Chowk. The delicacy is prepared and available only in coolest months, between December to late March (before Holi). It is believed that with the sun rays getting hot, the sweet melts. Do not even think about carrying this home, it is a bad traveler! You have to enjoy it instantly by visiting the shady lanes of Old Delhi. Taste the Best: This winter delight is sold at large in Chandni Chowk, but for the authentic variety do visit Babu Ram Kumar & Brothers. The Kumar brothers are from Uttar Pradesh and visit Chandni Chowk ever year during the winter months. The family has a long legacy of preparing this delicacy and today they have shops in other parts of Old Delhi, including Dariba Kalan, Kinari Bazaar and outside Chawri Bazaar metro station. How to reach: Get down at the Chawri Bazaar metro station and take a rickshaw to reach the shop. 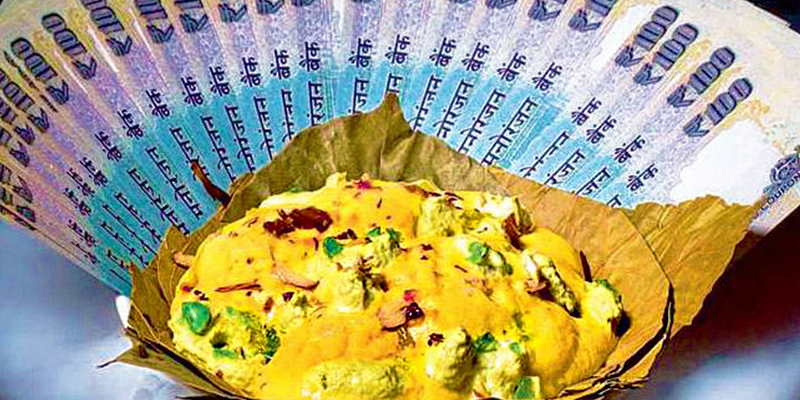 Cost: A dona of “Daulat ki Chaat” would cost around Rs. 40-50. Where else to eat in Chandini Chowk? Paranthe wali Gali, Anapurna, Kawarji, Haldirams in Chandini Chowk, Nataraj Dahi Bhale wala.